Generally speaking aquarium owners are not great fans of snails. Plagues of bladder and ramshorn snails are particularly common problems. However, there is a very useful and interesting species that can help get rid of them: the assassin snail. 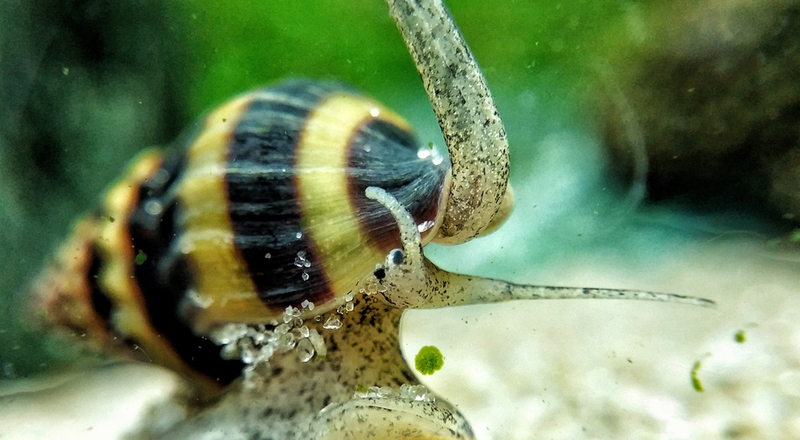 The carnivorous freshwater snail Clea (Anentome) helena glides nimbly along the base of the tank, stretching out its striking trunk in search of its victim’s slime trail. In terms of prey, the assassin snail favours other snails and their eggs. However, it will not spurn carrion either. Some reports indicate that assassin snails have sometimes even attacked pregnant shrimps, although fish should be safe from them. On capturing a snail as prey, the assassin snail uses its saliva to start digesting it before rasping off small fragments with its teeth. The saliva is so acidic that it can even burn holes in other snails’ shells to provide access to the tasty creatures inside. The little assassin snail grows to a length of up to 2.8 centimetres and originates from Asia, where it can be found in both flowing and stagnant waters. When not actively hunting, it likes to bury itself in the substrate to await its next prey. It therefore favours a sandy substrate. The assassin snail usually has a brown and yellow striped shell although single-coloured varieties also exist. If in danger or if a water body threatens to dry out, for example, the snail can use a plate (Operculum) to close the opening to its shell, sealing it from within. However, it also does this when sleeping to protect itself against possible predators or overly curious fish. Unlike many other snail species, assassin snails have two different genders. After being fertilised by a male, the females tend to lay one single egg about every ten days. The baby snail inside hatches some two to four weeks later and initially feeds on organic material in the substrate. However, the small number of eggs laid by these snails does not mean that they cannot quickly multiply in number – according to a number of reports at least. Anyone who wants to be on the safe side should therefore only put one such ‘snail controller’ in their aquarium. Anyone who combats a snail problem with an assassin snail should remember that this little mollusc will not necessarily differentiate between friend and foe. This means that intentionally added ornamental snails, such as nerite or clithon snails, will also be attacked and killed. Once the little assassin’s work is done, it does not have to be banished from the aquarium – if you offer it food tablets containing animal protein it will be more than happy to eat them.